I was born in Balfron Road, Govan, Glasgow on 31st December 1943; and moved with my parents to West London when I was seven years old. I was a bit of a cyclist early on, winning a couple of London Schoolboy TT champs but started cross country running at Sloane Grammar School on a day when Football was cancelled. Our playing fields were close to Wimbledon Common and I quite enjoyed the afternoon out on a run in my footie boots. Interestingly a certain John Bicourt, from the opposing football team and Belgrave Harriers, came along as well. In the 1968 Mexico Olympics, John ran in the steeplechase. The school had had some good runners before this but there had been a hiatus and the master in charge decided to organise a few cross-country matches with other schools. I soon found myself scraping into the London team for the Schools Inter Counties at Birkenhead which was a bit of an eye opener. It was at this time I joined Ranelagh Harriers, one of the original country and road clubs in the London area, and in September 1960, after I had left school, started training in earnest, racing on the country and in road relays. This suited me fine. In 1961 at age 19 I ran 50 14 in the Reading 10; and 50.04 in the Shaftesbury 10 so people took an interest in me. I had joined Springburn Harriers at this time and ran a couple of Junior XC championships with them as well as a couple of Edinburgh to Glasgow Relays. Springburn had a very youthful team at that time, with some very talented young runners, who were far better than me, particularly on the country. At the age of 21 I ran three 20 milers, including the Inter Counties, all under 1hr 50m. At that time there were a lot of good young distance runners around. Where are they nowadays? The next year, 1966, I ran my first Marathon, the Oxfam, finishing 2nd on a stinking hot day in 2hr 35.Two years later I won it, again on a hot August day in 2.22.05. I always seemed to get very hot days, and seemed to cope better than nearly all the other runners, but the consequence was the times were slowed. Ian Macintosh leading in the 1966 Finchley 10, in front of Peter Yates on the left and Colin Kirkham on the right. Ian finished second to Peter. I continued on the road and country with very occasional track races in the Insurance Championships at Motspur Park. One of my memories during the 60s was running in a flooded Basildon 10 where we had to paddle through a couple of road underpasses. A photograph of Gerry North and me, wading through water, was shown on the front of ‘Athletics Weekly’. Gerry beat me in a sprint finish and we ran 51.20-ish. A good run, at the Maxol Marathon in 1969, got me a GB trip to Enschede in Holland where, after running a personal best 10k in 30m 30sec, I fell apart in the last 5km to finish 4th, after having led for about half the race. This one was not on a hot day: it actually poured with rain for most of the afternoon. Well, I gave it a go! 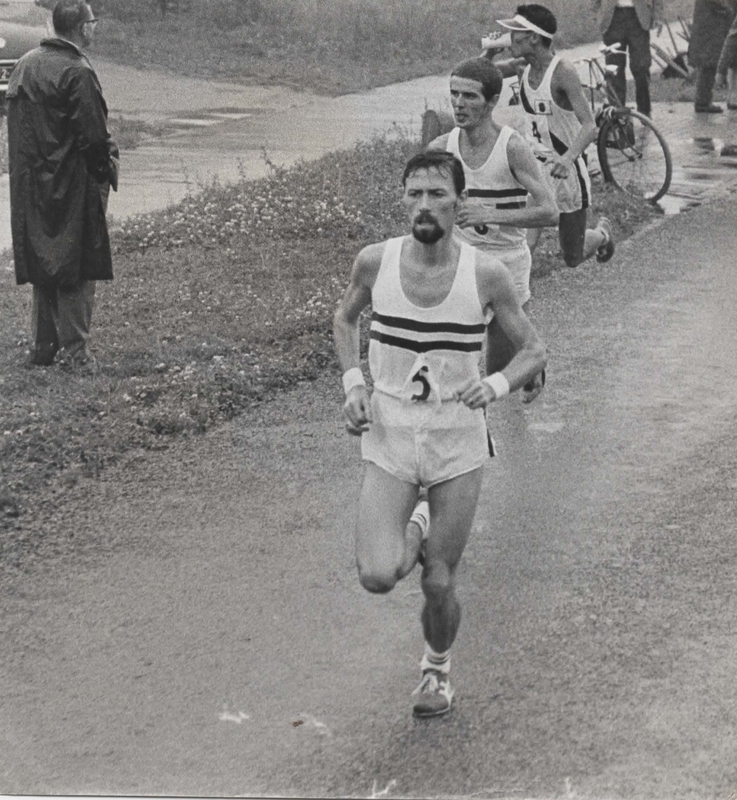 Ian Macintosh, wearing a GB vest, leading at Enschede 1969, in front of John Fewery and Matsubara of Japan. Ian was fourth at the finish of this famous race. The club also completed the Offa’s Dyke Relay and the Pennine Way in record times, much to the chagrin of some Northern clubs, who thought, as a London-based club, we were not worthy. At one stage I was part of the three-man team, with Chris Brasher and Dr Ian Milne, that broke the South Downs record – some 80 miles. Three men in a car. One runs a stage, one drives and one navigates. Then you change roles for the next stage and so on. All good fun but quite exhausting. It was Chris Brasher who suggested that I run the Scottish Marathon in 1978. Chris was a bit of a mentor to me and I had just run the Ranelagh Club 10 mile road race in 49.30 on a hilly course in Richmond Park one Wednesday evening and, over a beer or two afterwards, he said I should enter. The tale of Ian’s 1978 Scottish Marathon victory was told in a book about the event’s history – ‘A Hardy Race’ – as follows . 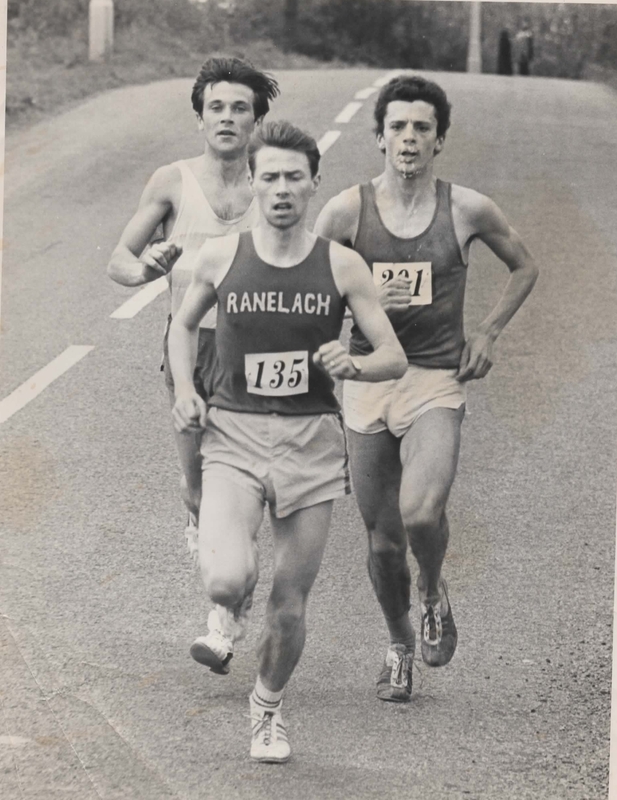 “Ian Macintosh of Ranelagh Harriers had never considered himself an Anglo Scot because both his parents were Scots and he had been born in Glasgow, living in Govan until he moved to London in 1952. Ian had run Scottish Junior Cross Country races for Springburn Harriers. In April 1978 Ian had some dental work done and, within a week he was ‘flying’. His usual plan involved very little training (but a few cross country races) in January and February. He was only 5 feet 5 inches in height and weighed ‘eight stone and a couple of pounds dripping wet’. In March he went straight into several weeks of eighty to 120 mile weeks, all run at under six minute miling! He believes he got away with this because of his weight and natural style and cadence. He used to race the Finchley 20 and maybe the Inter-Counties 20 a few weeks later. In the Ranelagh 10, over a hilly course, Ian surprised Bob Richardson, an English Cross Country International, by beating him by a minute in 49.30. In the bar afterwards, Chris Brasher (of Bannister mile, Olympic Steeplechase and London Marathon fame) suggested to Ian that, since it was Commonwealth Games year, he ought to try for the Scottish Marathon team. Jim Dingwall had already been selected. Ian knew Bob Dalgleish through his Springburn connection, so phoned him up. Bob got him into the SAAA race as a late entry, telling him that he had to win the race and run 2.18 or faster to be considered. Unfortunately it was to be the hottest June day in 25 years, with the temperature touching 90 degrees – so fast times seemed very unlikely, despite the fact that Ian ran well in the heat. His kit at the time was a light pair of New Balance racers, a white thin mesh vest with the Springburn diamond badge, Ron Hill Freedom shorts and white socks with red and white stripes with the tops turned down to the ankles. Ian remembered the route as probably similar to the 1970 Commonwealth route, which he had watched. At that time he and his friends camped at Musselburgh and ran up the hill to Meadowbank each day. The Scottish Marathon in 1978 was ‘run at a fairly fast rate despite the heat. By the return journey, Don Macgregor had gained a couple of hundred yards on me and there was a large gap behind. It was a fairly lonely run back to Edinburgh but as we came through a built up area, there was Alan Storey (later to be London Marathon organiser) with a pint of beer in his hand. Alan told me that Don looked to be struggling and that I could catch him. They all say that, don’t they? The result was: first Ian Macintosh 2.23.07; second Don Macgregor 2.23.33; third Eric Fisher (EAC) 2.28.15. As predicted, the hot weather made Commonwealth Games selection impossible. And in fact, although Ian was promised a representative vest for Scotland in another fixture, he is still waiting for the phonecall. From his Finchley 20 performances of 1.40 – 1.44, he felt he had the potential to run a marathon in 2.15 – but it was never to be. In retrospect Ian feels that SAAA officials were parochial in their choice of athletes for Scottish teams. He cites the more recent case of that fine marathon runner Karen McLeod, born in Skye, who spent a fortune travelling from Bath to represent ESH, before at last her performances were recognised. Ian continues: I moved with my work to Bristol in 1979, the year after my Scottish Marathon win and joined Bath and Percy AC . We renamed it after a couple of years City of Bath AC and now, based at the University, it is Team Bath. 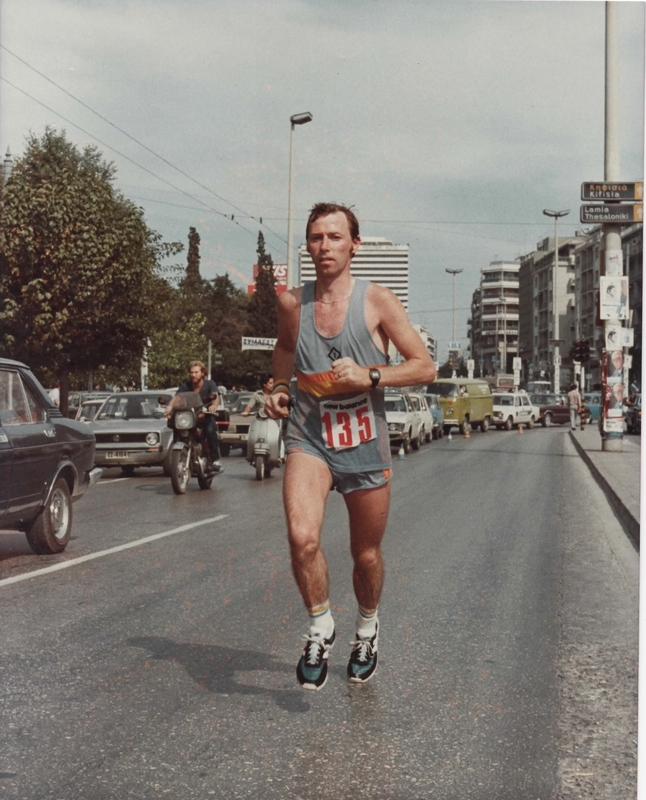 In 1981 I ran in the Athens Marathon. The event was delayed for three days because of their first democratic General Elections. Again my attempt at a modified diet was foiled. The start was a shambles and I never got into the front bunch but worked my way through to another fourth. Another hot day, finishing in the original Olympic Stadium. Next day I ran from my cousin’s flat into town and back. Nearly 40 Km: feeling as good if not better than I did in the race. 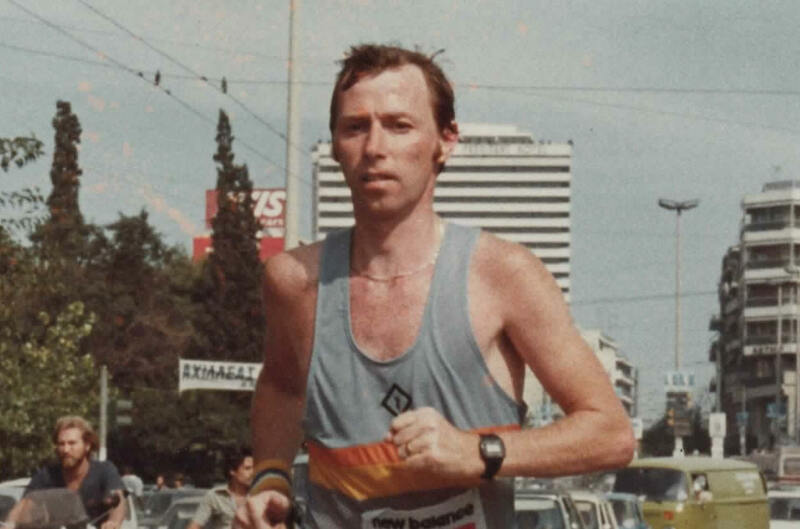 1981: Ian heading for fourth place in the Classic Marathon to Athens race. I had also become course measurer and was involved with the first London Marathon, as well as helping out with various duties prior to the race in later years, mainly through Chris Brasher and Hugh Jones. I had also been invited to become an England and GB road Team Manager, and managed on a couple of trips abroad and with England to the International team races held in events at Livingston and at one of the Aberdeen Marathons. It was here that, as mentioned in ‘A Hardy Race’, I found out about the Scottish Marathon Winners’ Quaich – the A.H. Blair Memorial Trophy. Nowadays (2016) I’m not really involved, other than as a Trustee of Avon County AA, and listening to my friend John Robbins, who is County President, whinging about the complications and frustrations of trying to keep local grass-roots athletics, road and XC running smoothly. I thought a few years ago, when I was County Chairman, that they, the powers that be, were trying to make the lines of communication simpler, but there now seem to be so many committees and advisory groups sticking their noses in, that I’m glad I now have other hobbies to keep my brain engaged. With my friend John, we now walk our old training routes, around the East of Bristol and into the hills above Bath and in the Avon Valley, rather than run. It just takes at least twice as long.